EZscan™ II is a universal video processor that supports both scaling and scan conversion. 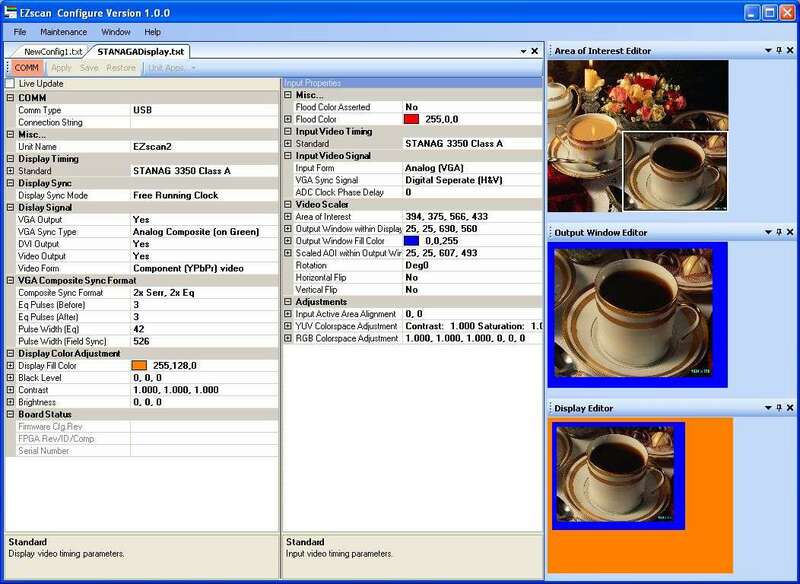 EZscan™ II receives video in various formats, processes the video, and re-transmits the video in a user-selected format. EZscan™ II supports the following video formats on both the input and output: RS-343, RS-170, NTSC, PAL, STANAG, DVI-I (TMDS and analog RGB). In addition to converting analog RGB for TFT panels, the EZscan II is great for digitizing interlaced video formats such as RS-343, RS-170, and STANAG. The EZscan II can also be programmed to support custom or non-standard video formats. The EZscan II supports a wide range of video formats and special video requirements. The EZscan II can be configured to work across a wide range of applications, minimizing new design work and sparing requirements. The EZscan II supports video rotation (in 90 degree increments) for applications with sideways mounted displays, cameras, or other video sources. Video can also be flipped from top to bottom or left to right for specialty applications. If you need to work with higher resolution video or are interested in video blending using multiple inputs, check out the EZwindow4K.